The new lighting consumes 45% less energy and lasts 50% longer. It also contains less mercury and is less harmful to the environment. 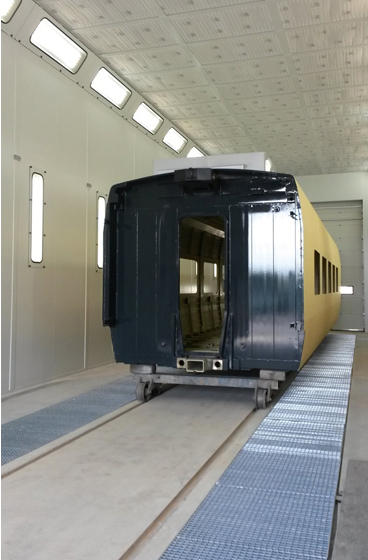 Until now the traditional T8 fluorescent tubes have been used to light the paint spray booths manufactured by Geinsa. Recently, this company’s Engineering Department has incorporated a more efficient technology into its products, replacing these tubes with the T5. The “T” indicates that bulb is tubular in shape, and the last number is the diameter in eighths of an inch, that is, T8 = 8/8 = 1 inch, and T5 = 5/8 inch. The T5 tubes are smaller in diameter, therefore. In terms of the advantages of the T5 tubes compared with the traditional T8 ones, the following points can be mentioned. T5 technology is around 20% more efficient than T8. Experiments have shown that the T5 system consumes around 45% less energy than the T8. The average standard life of the T5 tube is 50% greater than the T8. The T5 tubes have 4 times less mercury content, so they are less harmful for the environment, although, like all fluorescent elements, they must be recycled at the end of their working life. As a result of all the parameters mentioned, the T5 technology seems to be the best option in terms of present-day fluorescence. The only disadvantage worthy of note is the replacement price of the fluorescents. Currently, the price of the T5 tube is around 50-60% higher than the T8. In terms of LED technology, this has also been studied by the Geinsa Engineering/Quality department and it can optionally be offered.